The goal of the game is to have the most Victory Points (VP), earned by developing your Kingdom during the game. 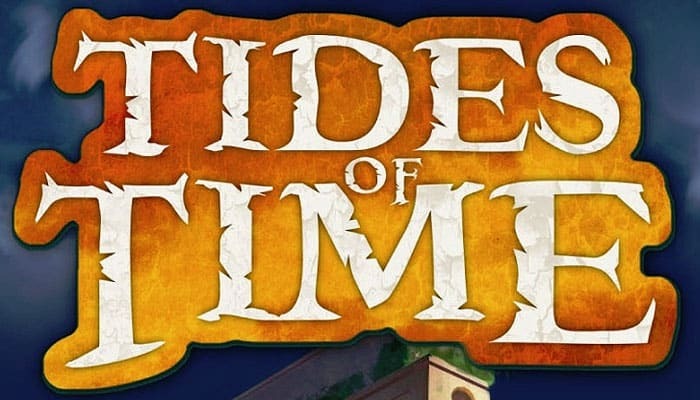 The game consists of 3 rounds in which players draft cards from their hands to build their Kingdoms. After the last round, players sum up their VPs scored during each round to reach their total score. The player with the most VPs has built the greatest Kingdom and wins the game. Every card has a name 1 and an ability 2. In most cases the ability is a scoring objective which provides a certain number of VPs 3. 15 cards in the game have a suit 4. There are also 3 cards without a suit. There are 3 cards for each of the 5 suits representing different types of locations: Palace , Library , Garden , Temple , Stronghold . Shuffle the cards and deal 5 to each player. These cards are the player's starting hands. Set the remaining cards aside, face down to form a Draw pile. Place the pencil and notepad aside. 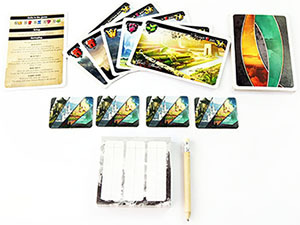 Each game consists of 3 rounds in which players draft cards from their hands to build their Kingdoms. At the end of each Round, players total their Victory Points based on the fulfilled scoring objectives on each card. After the 3rd round scoring, VPs are totaled and the winner is determined. Both players simultaneously choose a card from their hand and place it face down on the table in front of them. After both players have chosen a card, reveal the cards by turning them face up. 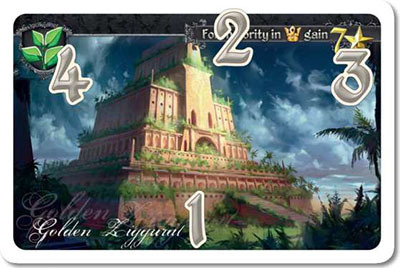 The revealed cards stay face up in front of the respective player to form their Kingdom. The players now exchange the remaining cards in their hands with each other and choose the next card to play in the same manner. The round continues this way, with players choosing one card to play and passing their hand, until all cards have been played. At the end of the round, players count the Victory Points scored from the objectives on the cards in their Kingdom. Record these scores using the notepad and the pencil from the box. The Roof of the World doesn't give the player any VPs but doubles his most numerous suit, therefore he has 4 . The Eye of the North gives the player 6 VPs (the player lacks 2 out of 5 suits in the game, therefore he gains 3 VPs for each). The Vestibule gives the player 12 VPs because thanks to the The Roof of the World the player have 4 . Although both the player and his opponent have 1 , Kings Nest makes the player win all the ties therefore Ancient Divide gives the player 7 VPs. The player sums his score for the first round and has 25 VPs in total. After scoring players take all their cards from their Kingdom back to their hands. Each player chooses one card which they will leave in their Kingdom for the rest of the game and a second one to discard from the game. Players reveal their chosen cards simultaneously. 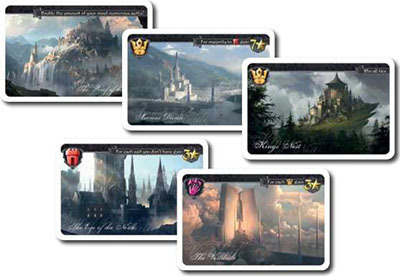 The cards remaining in play should be marked with the Relic tokens as a reminder to the players that these cards stay in their Kingdoms, and provide their suit and ability for the remainder of the game. The discarded cards are returned face up to the game box and they will not be used in the remaining rounds. Each player draws 2 new cards from the Draw pile so that they each have 5 cards in their hand. Now they can proceed to the next round. Round 2 is played exactly the same as Round 1 with the following exception: at the end of the round (after Victory Points are calculated ), players only take the cards played in Round 2 back into their hands while the Relic of the Past from Round 1 is left in their Kingdom. The remaining steps of the round are the same. After Round 2, each player should have 2 Relics from the Past in play and 5 cards in hand. Round 3 is played exactly the same as Round 1 but it ends after Victory Points are calculated. After the 3rd round players total their points from all 3 rounds to find their final score. The player with most Victory Points is the winner!